There are two special events you can thoroughly enjoy this holiday season and know that, by doing so, you are also giving to worthy causes. 1. 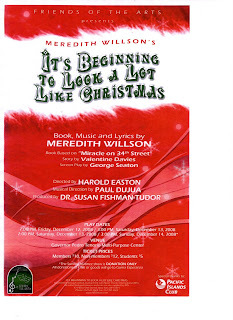 Friends of the Arts presents it play, IT'S BEGINNING TO LOOK A LOT LIKE CHRISTMAS, a stage version of "Miracle on 34th Street" at the Multi-Purpose Center on December 12, 13, and 14. The Sunday matinee show is a benefit for Guma Esperanza. There's no ticket price for Sunday: You donate dry goods or cash for your entry fee. Or you can come to one of the other shows (Friday and Saturday evenings at 7 PM or Saturday matinee at 3 PM), pay your ticket price ($12 for adults, $10 for FOA adult members , $5 for students) and give a donation for Guma Esperanza, if you want, in advance. It's the season for giving and these two opportunities are here. Hope you'll join me. Sorry, "Susan" but your comment looks like spam.